For those who are interested in some of the details how a movie is produced, here are some inside experiences sorted according to topic. How does our set look like? Compared to a movie with a larger budget, probably rather simple - we can not afford an expensive camera or sound recording equipment to get high-quality sounds on the set, so most of the time there's just a simple camera (dependent on angle and movement hand-held or tripod-mounted), the director and the actors, with the camera angle chosen such that no modern equipment is visible. 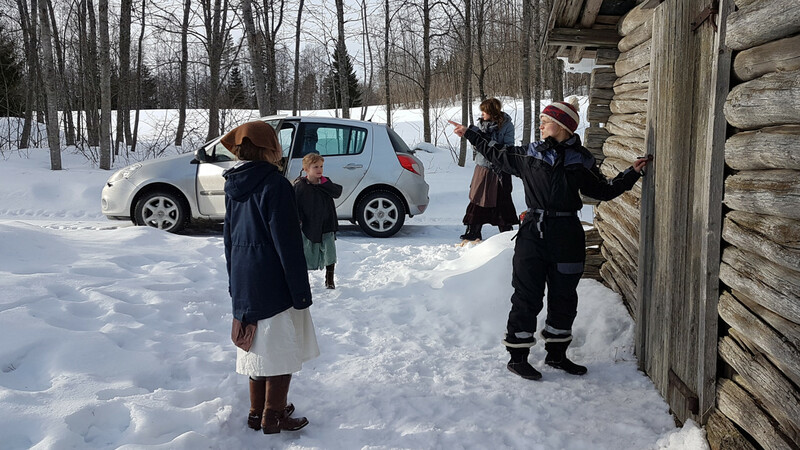 Since we work in real snow (and at the time of 'Blood in the Snow' this means half a meter of it), the set has to be prepared to be accessible for the actors by cleaning some of the snow away or trampling a path. Also, for camera work, wearing overalls is a good idea because you might need to lie down into the snow or move into the deep snow in the forest to get a good perspective. 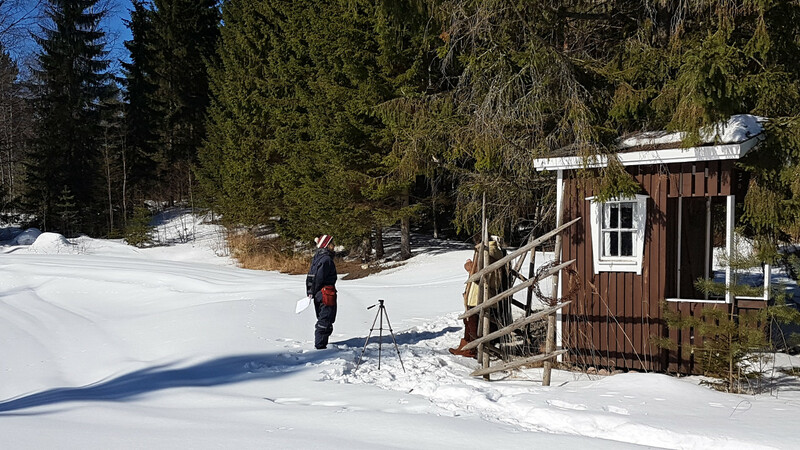 Sometimes we've been working in fairly cold condition (-14 deg C probably was the lowest). 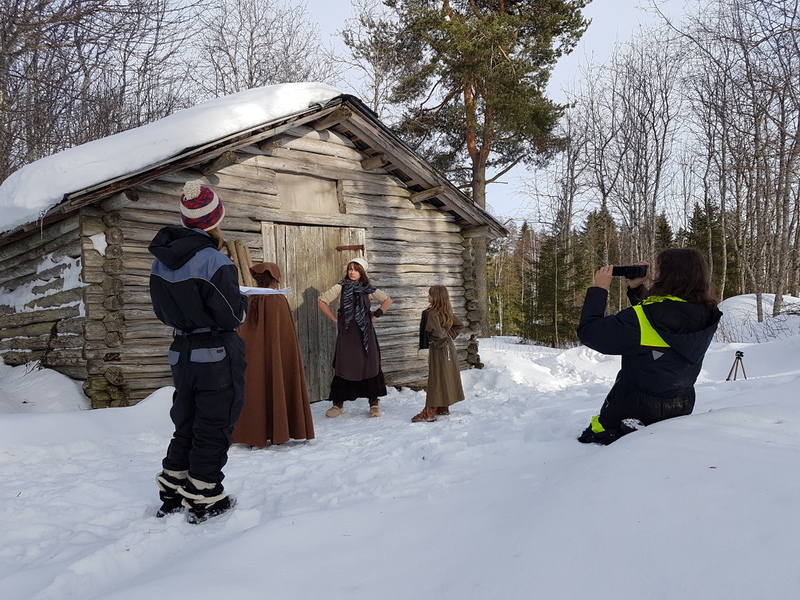 The medieval costumes we have aren't exactly suitable for these temperatures, so there's warm jackets and hot water kept nearby to warm up as soon as the take is done. If you sometimes see Clíodhna like she's really cold and shivering in a winter scene, that's mostly not brilliant acting, she actually is getting cold! Otherwise there's a fair amount of tricks going on, in terms of what we show in the movie and what is really just outside the camera angle, or how we force perspectives to make it seem a room is larger (or smaller) than it actually is. For instance, in the movie you can see Rórdán and Siofra leaning on a fence they were just building and having a break. What you can't see is that the fence in reality is really short, and that there's in fact even a small building nearby! What do we do on the set? The first thing usually is that we look at the light and select and try out camera angles. All the actors go through the motions if possible (still wearing warm jackets) and we discuss what scene we want to have from what angle. Especially with snow around, we also decide upon a sequence of takes such that we minimize continuity problems with tracks in the fresh snow. Often the camera needs to be positioned via a de-tour to avoid a set of tracks leading right from the scene to the camera position! Only once all that is settled, we make sure the modern equipment is hidden from view - and the actual take can begin. Typically we do a scene for 3-5 good takes from various angles and then do short clips of details we want to show. And when it's all done, we quickly try to get warm again! How do we work with animals? There's lots of different animals appearing in the movie, and what we do really depends on the animal - some (like dogs and horses) can be trained, for others (like cats or rabbits) this is not so easy, yet others (the various birds) are wild animals and all we can do is capture them on video. A modern camcorder is actually rather capable, and one can get decent videos even with the camera hand-held and 90x zoom, so birds can be filmed from quite some distance away. Cliodhna's cat, Eibhlinne, is one of the bigger challenges. 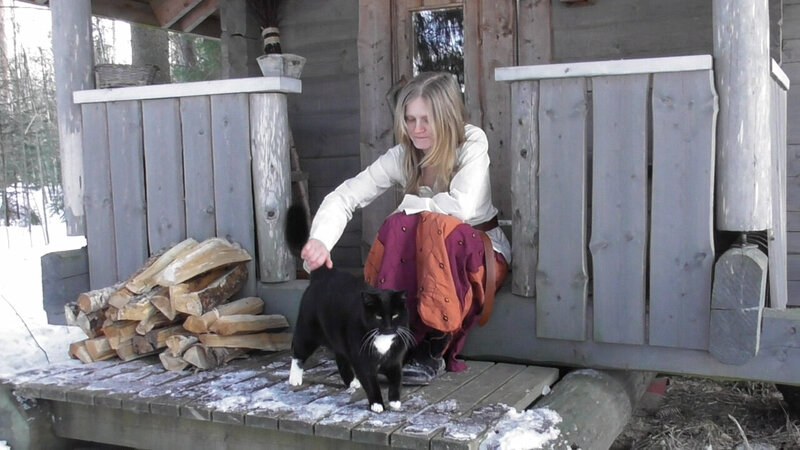 Shooting Eiblinne scenes requires some patience - we first get the cat Mikosch (Eibhlinne is actually played by a tomcat...) to the set and feed him there - then we do scenes with him on Clíodhna's lap and finally we let him roam free with the camera ready, in the hope that he'll go looking for more food and eventually do what he's supposed to do, with Clíodhna ready to start her scene as soon as the cat does something useful. Generally it takes a while, but so far we've been lucky - though outtakes are unusually frequent in animal scenes. All the horses depicted come from Doris' stable Horses and More, and they can be at least partially trained for the task. Usually what we require is part of normal riding-horse training (being led by a person, standing still while hooves are checked, carrying a load,...) but there are also more complicated problems. 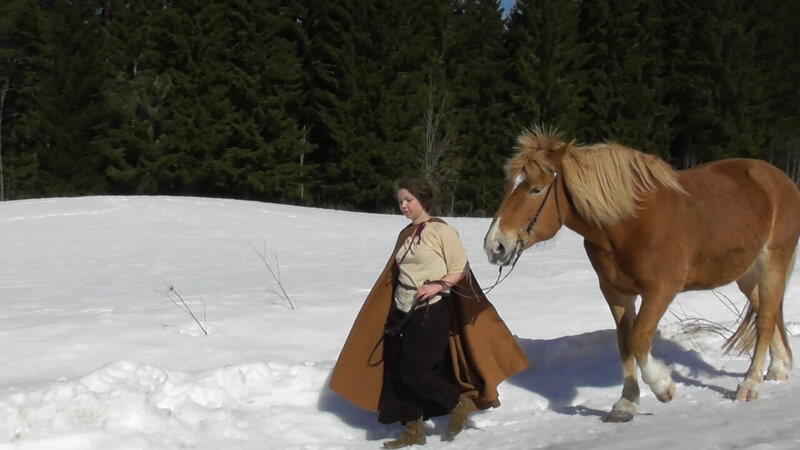 For instance, we will need a scene in which a rider-less horse trots along a forest path, and preparation for this start a few months in advance be leading the horse again and again along the path till it gets used to the task, so that things work out okay once we're there with the whole film crew in summer. What is done during sound post-production? If we would take the sound as recorded on the set for the final movie, all voices would sound muffled, volume would change quite a bit between different camera angles and voices far from the camera would be difficult to hear at all - not to mention the presence of unwanted background sounds. This is the reason we have to do sound post-processing. Generally this is complicated and requires many different steps. First of all, there are some sounds in the recorded streams which we want to preserve - footsteps in the snow, or the sound of a door opening, because in the original footage these are perfectly synchronized with the video stream. For that reason, we separate the sound stream from the recorded video and clean it from noise with special audio processing software (audacity). Voices we record again, and to get them right with the visible lip movements, we either have to do it watching the movie or using the originally recorded voices as cue. Because such studio-recorded voices sound too crisp and close-by, we then process them for frequency attenuation (dependent on whether the scene is inside or outside and how far the camera is away, high frequencies get cut off more or less) and add a reverb effect to simulate the acoustics of the scene. Afterwards the voices are carfully merged back in sync with the video stream, taking care to adjust their stereo position to where the speaker is located. The various sound layers (in green) of a relatively simple scene. However, the work is not done yet at this point, because there might still be subtle sounds missing. In fact, if you look at the above picture of a scene in the video editor, there are four distinct sound layers (in green) - the first are the sounds recorded on the scene, the last are voices - what then are the other two? 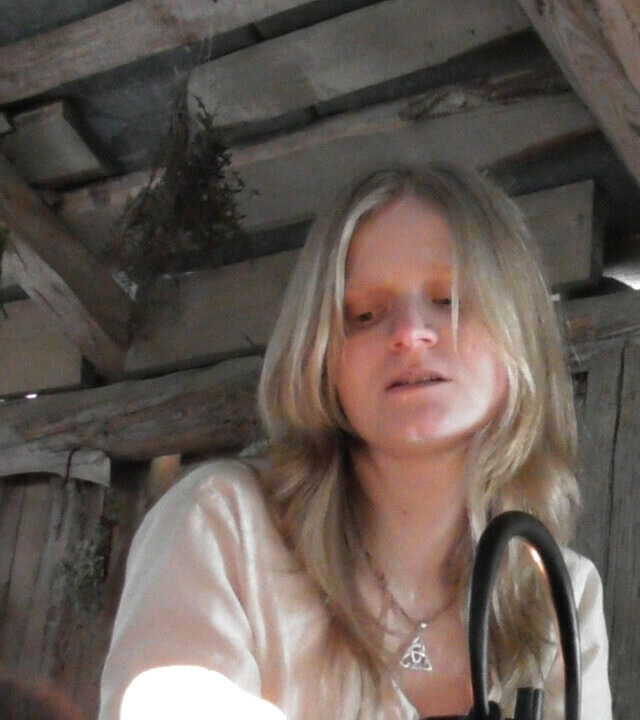 The first continuous one is the ambience layer - we usually add a subtle layer of background sounds that characterize the scene - inside Clíodhna's hut, this might e.g. be the sound of a fire. This should not be very notable, but it does affect the mood of the scene. The last layer is the so-called Foley layer (named after Jack Foley who first introduced this to movie making) containing sound effects that are added after the fact (and are usually just a bit enhanced over reality). For instance, shaking a bedsheet or putting a cup down on the table makes characteristic sounds that are not very audible when directly recorded, but if an exaggerated version of them is added to the scene, they make it come alive more. In fact, if you watch any movie and listen to the sounds, you'll be able to hear many sounds which never quite sound that way in reality but would really be missing if they were absent - and that's what the Foley layer is for. And naturally also the Foley layer has to be adjusted for scene acoustics and stereo positioning. So the final sound you get to hear in the movie is the combination of all these four layers merged together - which is quite a bit more work to do than the video itself! What is done during video post-production? A modern digital camcorder is quite a sophisticated device capable of shooting videos over a large range of lighting conditions with decent quality, but in most conditions we still want to post-process what we record. One reason is that we do not have perfect control over the lighting at the set. For instance, in interior scene Clíodhna's hut is lit by candles and a fireplace - but it'd be very awkward to get a fireplace going on the set, and the light would also be too dim for the camera. So normally we take care to do the camera work on the set with sufficient light such that the camera delivers good-quality video and that shadows and the balance of direct to indirect light looks okay and adjust to the actual light we imagine for the scene later. The first step is to run a gamma correction over the camera image - dependent on how this is used, it can deepen the shadows and give the scene a more dramatic appearance by using the full color range, or it can dull contrasts a little. Where needed we combine this with a brightness filter when the camera failed to deliver at the lighting we need. In the second step, we then utilize a subtle tint filter to color the light according to what the light source in the scene is supposed to be - a warm golden light for candles, a slightly more reddish light for only fireplace, or even a blue-violet tint for early morning scenes outside. The tint filter very much influences the mood of the scene. The original image recorded by the camera. The image after gamma correction. The final tinted image used in the movie. Also, generally night scenes aren't actually recorded in darkness (the camera produces a video image in moonlight, but it is very noisy and poor quality) - rather we do the take at dusk when the sun is below the horizon and the sky starts to get dark. Then all direct light is gone but we still have plenty of indirect light, which we later darken and tint bluish during the post-production stage. In this way, we end up with better video quality. The above workflow is used on nearly every scene in the movie, but for a few scenes we also utilize more sophisticated filters such as Gaussian blur, edge detection or ripple effects to create the visuals of e.g. magic being done. If you want to see it all in motion, with examples from the movies and a commentary by the HakalaFilm team, go watch our 15 minute 'Behind the Scenes' feature on YouTube. Created by Thorsten Renk 2018 - 2019 - see the disclaimer, privacy statement and contact information.